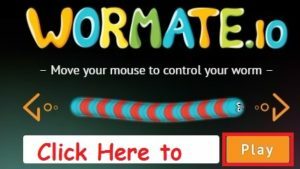 Play wormate.io Game onine : its best and funniest version of slither.io. Developers of io games did not make us wait long and created a new game called Wormate.io. This game has a Russian interface, which will allow you to learn all the rules and more information about this game. The new Features that add in Wormate.io is sweets, instead of the small dots on the map, you will collect various sweets such as donuts, muffins, cakes and many other very tasty sweets that are scattered all over the map. Never forget that this is a multiplayer game and ton of player are their to make you loser. They are also wondering here for sweets and smash snakes, such as you! When you get success to destroy other players, he drops unlimited number of different sweets for you after getting dead, you cand eat them to gain a lot of weight and become large, which will give you many benefits. Their are different type of sweets with hidden bones and points. such as a magnet, weight gain, invulnerability and many other useful surprises. Try you best to drive your snake perfectly otherwise you will Become dinner of other players. Use Speed boost to run away from others and a tricky use of speed destroy them at the same time. But keep in mind that the more you accelerate, the more weight you lose and in result you become small and small. You can make awesome snake with mods and skins that is optional for users. Try to catch as many sweets as you can., to become the biggest worm and win the candy world. Good luck!